Home / Blog / What are the best fibers used in bed linens & sheets? There are many choices when it comes to bed sheets. You will find that bed sheets may range in price from $50 to $2,000 and everything in between. We also think it is safe to say that one sheet may not satisfy everyone's specific needs. So, below we break some of the options down and identify some of the benefits and drawbacks of the each popular bed sheets in the market today. Bamboo – Is inexpensive. It may start out soft, but with some bamboo, it gets rough or coarse over time and the fabric may pill. We have found it not to be as durable as many other fibers. Click here to learn why the claims of it being eco-friendly and antimicrobial are false. Modal – Can be expensive and soft, but we’ve found some of it to be lacking in durability. Silk – is certainly soft. However, silk snags very easily and is difficult to clean. It doesn't breathe well and, therefore, can be hot and clingy. While good silk is expensive, it is not as durable as some other bedding fibers. Microfiber - Is inexpensive and not as durable as other fibers. Microfiber is soft to the touch and less prone to wrinkles. Some find it clingy, and it can be hot, as it does not wick moisture as well as other fabrics - it is typically 100% polyester. Said another way, it is plastic. Linen – Linen is made from the Flax plant. Good linen is expensive. It wrinkles more than cotton, but it is durable. Many don't care for linen, as when it is new, it often feels coarse, and may take 30 to 50 washings to soften it up. Cotton/poly - People purchase cotton/poly sheets because cotton/poly bed sheets are less prone to wrinkles than some other fibers. Cotton/poly are less expensive than high-quality 100% cotton sheets. Cotton/poly sheets do not feel as nice next to the skin as some other fibers. 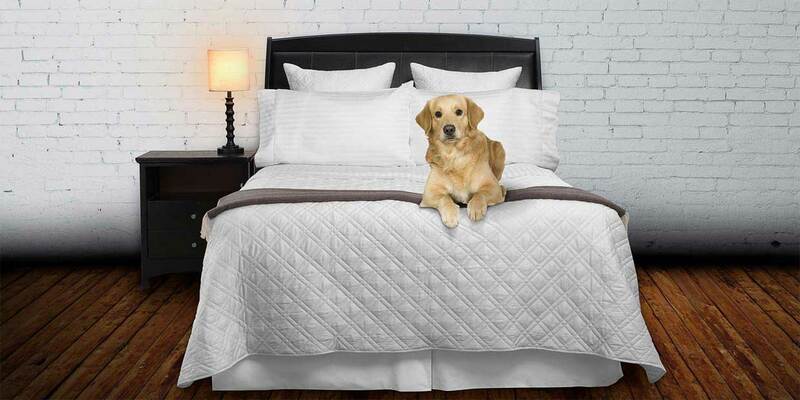 Because of the polyester content, many do not find them as comfortable to sleep on as they don't wick moisture as well. Cotton – Is most popular of all bed sheet fabrics. Cotton is very durable and washable. It has good wicking properties and is available in many different qualities. Cotton bed sheets are found in many different grades and price points. Finer grades of cotton are also more durable than lower grades. If properly cared for a good set of 100% cotton bed sheets can last in excess of 10 to 12 years. Look for 100% Cotton. 100% Cotton sheets are the best overall fabric for bed linens. Keep in mind that not all cotton is created equal. Look for Long or Extra-Long staple cotton, as the longer fibers are softer and will become even softer with continued washings. Finishing details – Finishing does not add comfort or softness to a sheet. However decorative details can create an aesthetic appeal. These finishing details also represent some of the pride and craftsmanship that went into the product. Mattress manufacturers have become creative when it comes to mattress thicknesses. Today mattresses are found in thicknesses ranging from 9” to 24” and everything in between. To be safe, measure the thickness of your mattress before you purchase your next set of sheets to ensure your new fitted sheet will not be too small. Fitted sheets that are too tight or not deep enough may slip off the corners. If your fitted sheet is too tight the fabric will be under tension, this may cause premature wear. It may be challenging to put an ill-sized fitted sheet over your mattress. Keep in mind that some of the finest luxury bed sheets can sell for upwards of $1,800. It is the retail mark-up, the quality of the cotton, and the finishing details that determine the price. Retail distribution results in high price markups, typically ranging from 225% to 250%. When a designer’s name is placed on the label, that designer also takes a cut of the proceeds. Vero Linens has zero mark-up on our bed sheets because we don't sell to retailers. Without a retail mark-up, our customers save up to 60% over like quality linens sold in retail stores. At Vero Linens, we bring you the highest quality in elegant Italian linens, duvet covers, and other fine bedding products. Shop for our luxury Italian bed linens below.